Convert number into word in excel in Indian Rupees,, this code will work in all version of Microsoft Excel like (2003, 2007, 2010, 2013). Just fallow these easy steps. SpellNumber = SpellNumber & " Crore "
SpellNumber = SpellNumber & " Lakh "
SpellNumber = SpellNumber & " Thousand "
SpellNumber = SpellNumber & WORDs(Val(Left(FIGURE, 1))) + " Hundred "
SpellNumber = SpellNumber & " Paise "
SpellNumber = SpellNumber & " Only "
Very useful. Thanks for sharing the code. Please let me know whether this will work in all excel file or a particular file? 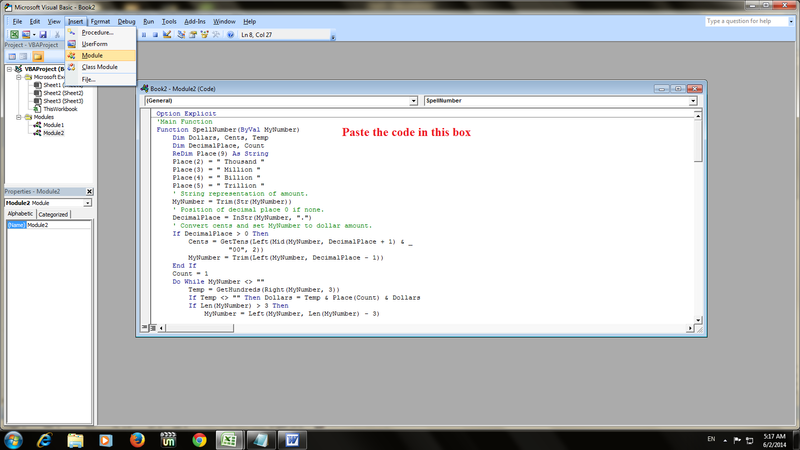 It works on the particular excel file where we put the codes. Can you please tell me how to add this codes in all excel files!! Thank you ! Need this feature on your android phone ? You have problems writing your amounts in letters on checks? transfer form? rebate check form? SpellMyAmount facilitate you all this; you enter the amount in numbers and it writes it for you in letters. SpellMyAmount is an Android application available on Google Play! How can we use for us dollars? Very useful. Thanks for sharing just like this code. Please share if we want to use it like this 1) Thousands, 2) hundred thousands, 3) millions, 4) trillions etc. but in another file, it does not work. Thank you very much. This worked great ! God Bless you. Thanks for the Program, its very useful!! Will this work in OS X? Can u pls tell me can i use spell number for Dollar & rupees at the same time??? Can i use this permanently, each and everytime i have to paste this code in same file also. kindly let me know permanent solution of this. but here i want set rupees beside of words mean set in last so how can set it? i want to know the how can i make full capital letter? There is a problem when you want to see the "paise" it appears like (12.5)=Rupees twelve paise fifty only. Please fix this in your code and inform me. Extremly superb. Explained very nicely. Thanks a lot. There is a error as "ambiguous name detected" when i put the formula please help..